Every knitter loves stylish patterns, quick projects, and stunning colors. 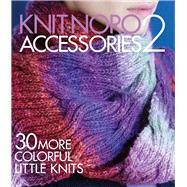 This collection of Noro knits has them all! Want more accessories to knit? This gorgeous entry in the Knit Noro series offers 30 brand-new designs that incorporate fun techniques—cabling, mitered squares, short rows, corrugated ribbing, slip stitch, and more—while still remaining accessible to knitters of every skill level. The projects make the most of Noro Yarns’ vibrant hues and bold self-striping patterns, and include gloves, socks, hats, shawls, ponchos, and more—all selected specifically for the ways in which they show off those trademark colorways and luxurious fibers.